In a small bowl, mix ½ dl (1/4 cup) water with the honey and dry yeast. Let it sit about 3 minutes until the yeast starts to bubble. In a bigger bowl, combine the flour and salt. Add the oil, the yeast mixture and the remaining water. Mix to combine and knead the dough until it's soft and elastic, about 5 minutes. Place the dough ball in an oiled bowl, cover with plastic wrap and let rise for an hour. After an hour, divide the dough into 4 balls. 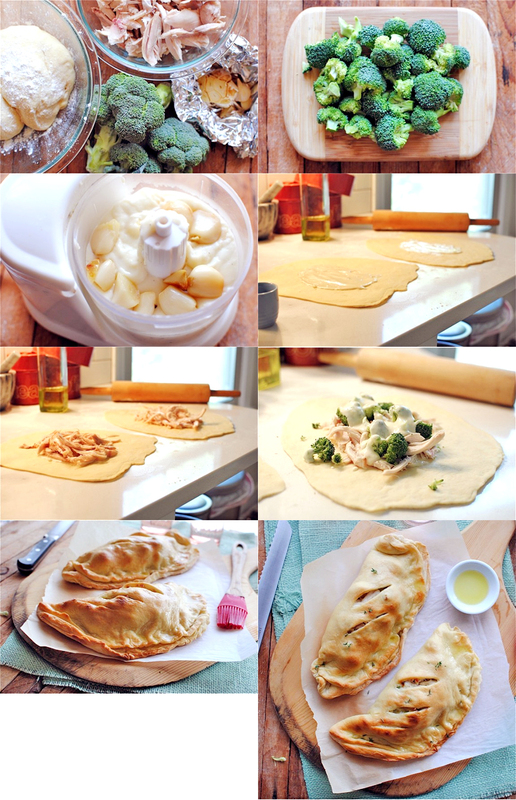 You can throw the leftover two in the freezer if you want, or keep going for 4 calzones (just increase the filling). Place them into 4 smaller, oiled bowls and let rise another 15 minutes. Roll out each dough ball until it's 25-30 cm (10-12 inches) in diameter, like a pizza. You're ready for the filling! While the dough is rising, preheat oven to 220 C (425 F). Lop the stem end of the garlic off, exposing the cloves. Place inside a small square of aluminum foil, drizzle with oil, fold up and roast 35 minutes. In a small saucepan, melt the butter. Once the foam subsides, whisk in the flour. Continue to whisk about 2 minutes, until it starts to brown. Whisk in the milk and keep whisking until it thickens and get creamy. Toss in a pinch of salt and pepper. Transfer to a small food processor, add the roasted garlic cloves, and blitz until combined and gorgeous. Adjust the oven to 190 C (375 F). Spoon some of the creamy sauce along the bottom of each crust. 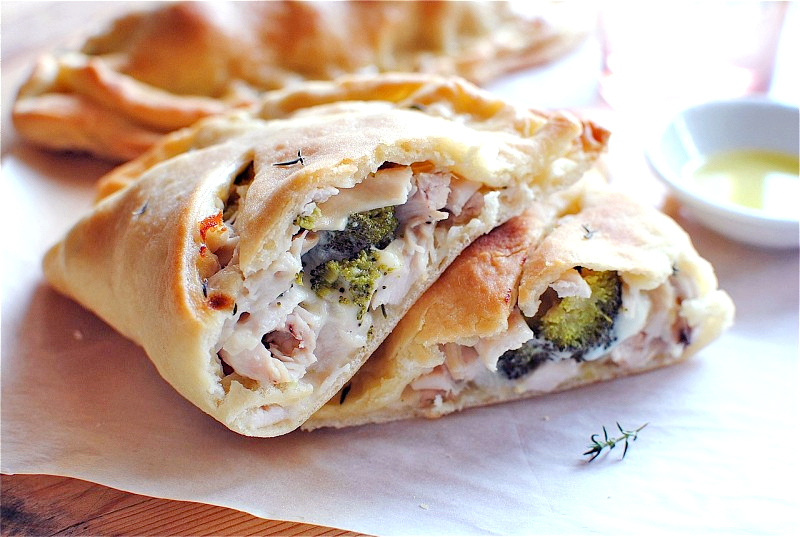 Top with shredded chicken and broccoli florets. Spoon more of the sauce (I'd say about 5 tbsp total in each calzone, or more if you want!) over the chicken and broccoli. Sprinkle with the lemon zest. Roll over the dough, creating a calzone. Transfer calzones to a baking sheet lined with parchment paper. Brush each one with a light egg wash or extra-virgin olive oil. Bake for about 25 minutes, or until the crust is golden brown. Let rest 5 minute, slice and devour.